While some cities require fast food restaurants to include calorie counts and other nutritional information in their menus, a new study has found that this has no effect on how much people eat. Cities such as New York City and Philadelphia require fast food chains to include calorie information on their menus. Menu labeling is aimed at helping reduce obesity and other negative health impacts from unhealthy diets, such as high blood pressure and high cholesterol. By making nutritional information available to people, it is hoped that they can make healthier diet choices. However, researchers at NYU Langone Medical Center have found that these calorie counts do not have a significant effect on how much people eat at fast food restaurants. This means that they will have no impact on obesity rates or healthy diet choices. In the new study, researchers analyzed data from more than 7,500 people who bought food at McDonald’s, KFC, and other popular fast food chains in New York and New Jersey. They compared how much people ate at restaurants that had calorie information and at those that didn’t. The results showed that people ate 804 to 839 calories per meal at restaurants with calorie information, compared to 802 to 857 calories per meal at restaurants that didn’t include any menu labeling. There was no noticeable difference in how much people ate. As well, the researchers also compared the findings to a survey from 2008 that tracked similar information among 1,000 fast food customers. The previous survey was performed shortly after NYC began requiring fast food chains to display calorie information. In the survey, people ate 783 calories per meal at restaurants with the calorie counts, compared to 756 calories per meal at restaurants without the information. Both the recent study and the previous survey seem to show that calorie counts do not have any effect on how much people eat. “Our study suggests that menu labeling, in particular at fast-food restaurants, will not on its own lead to any lasting reductions in calories consumed,” said Brian Elbel, co-author of the study and an associate professor at the NYU Langone Medical Center. Obesity is currently considered one of the biggest health issues in the U.S. More than one-third of Americans are thought to be obese, and that number is estimated to rise to 42% by 2030. He also believes that a system using symbols or warning signs could have a greater effect than listing calorie information, as people would not have to understand nutritional information or track their daily consumption. “You [would] just need to avoid that symbol,” said Elbel. 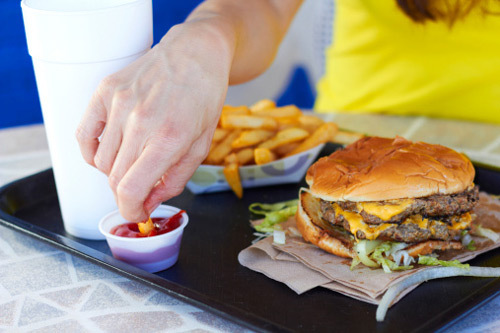 “Menu labeling at restaurants does not reduce overall calorie intake, shows study,” News Medical web site, November 3, 2015; http://www.news-medical.net/news/20151103/Menu-labeling-at-fast-food-restaurants-does-not-reduce-overall-calorie-intake-shows-study.aspx. Entis, L., “Those Calorie Counts on Fast-Food Menus? They Aren’t Working,” Entrepreneur web site, November 2, 2015; http://www.entrepreneur.com/article/252408. Goldberg, D., “Calorie counts on menus aren’t working, new research shows,” Politico New York web site, November 2, 2015; http://www.capitalnewyork.com/article/city-hall/2015/11/8581331/calorie-counts-menus-arent-working-new-research-shows. Preidt, R., “Fast-Food Menu Calorie Counts Not Changing Habits,” WebMD web site, November 2, 2015; http://www.webmd.com/diet/20151102/fast-food-menus-with-calorie-counts-not-changing-new-yorkers-habits.